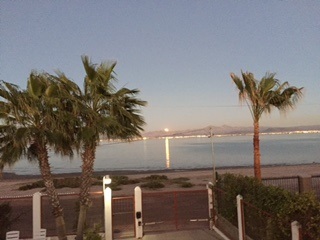 We just spent a month in La Paz, BCS, where I wrote a lot, had a couple of great book events, and then, on the way home, we took a shortcut. We normally cross the border south of San Diego, but while we were down south we heard the pavement from San Felipe (Mex 5) to Mex 1 was almost complete, so we decided to give it a go. I'm having neck problems, so this probably was not a great idea. If you want to see the road you do not want to take, click here.